Obsessed of capturing the best sunset in the city? The 2 hour sunset cruise will let you enjoy the Dubai skyline in both day and night. The cruise set to start at 5:00 PM lets you capture the sunset on its way till the Burj Al Arab and shows the same world lit up completely in the dark on its way back. The luxury cruise package includes an international dinner buffet catered by the five star Address Hotel, Dubai Marina, soft drinks and a live saxophone player. The rich views and the calm ambiance make it the favorite place to have an early dinner buffet with friends or family. This is a seasonal cruise and operates daily from the months October to May. Obsessed of capturing the best sunset in the city? The 2 hour sunset cruise will let you enjoy the Dubai skyline in both day and night. The cruise set to start at 5:00pm lets you capture the sunset on its way till the Burj Al Arab and shows the same world lit up completely in the dark on its way back. The luxury cruise package includes an international dinner buffet catered by the five star Address Hotel, Dubai Marina, soft drinks and a live saxophone player. The rich views and the calm ambiance make it the favorite place to have an early dinner buffet with friends or family. 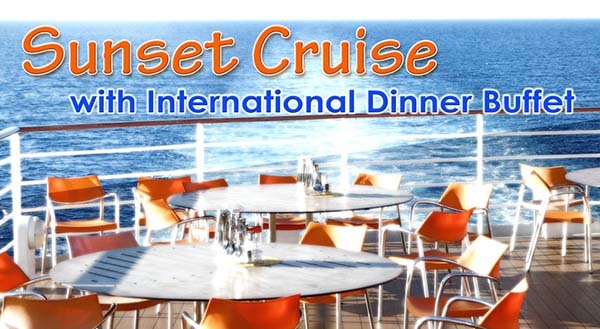 This is a seasonal cruise and operates daily from the months October to May.